Nucleophiles do not have to be ionic, or even "semi-anionic". The basic requirement for a nucleophile is a lone pair. If a nucleophile has a lone pair, it can donate the lone pair to an electrophile such as a carbonyl. By donating a lone pair to a carbonyl, it can form a bond. However, donation of a lone pair to a carbonyl is reversible. If there is something about the nucleophile/electrophile adduct that isn't very stable, the reaction may revert to reactants again. In the case of neutral nucleophiles, charge separation may destabilize the first-formed products of the reaction. Let's think about addition of water to propanone. Two neutral molecules, water and propanone, come together. The water donates a lone pair to the carbonyl carbon in propanone. That leaves the oxygen atom from the water with a positive charge, and the oxygen atom from the propanone with a negative charge. One easy way to get rid of the charge separation is for the water to leave again. That step would just be the reverse of the first one. On the other hand, another way to solve the charge problem is to move a proton (H+) from the positively charged oxygen to the negatively charged one. That turns out to be pretty easy to do. If that happens, a "hydrate" or a "geminal diol" forms. A geminal diol, or twin diol, has two hydroxy groups on one carbon. In the following cases, a nucleophile donates to the carbonyl, followed by a proton transfer. 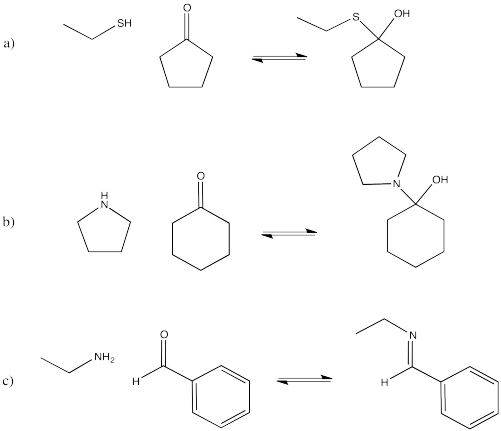 Show mechanisms, with curved arrows, for each of the following reactions. The immediate products that form from the addition of neutral nucleophiles to carbonyls turn out to be a little unstable. That's partly because they can easily revert back to reactants. It's also because there are other processes that carry the reaction away from the first-formed products and turn them into other things. For example, in most cases the reaction does not involve the simple addition of one nucleophile, but involves a second molecule of the nucleophile as well. We will keep looking at these other processes and see where these reactions lead. In the meantime, it can be useful to know the patterns that different types of nucleophiles will usually follow. For example, addition of alcohols to aldehydes or ketones leads to the formation of ketals or acetals. Ketals or acetals have the specific chain of atoms C-O-C-O-C, in which each carbon is tetrahedral or sp3. On the other hand, the addition of amines leads to a very different kind of structure. Instead of adding two amine molecules into the final structure, only one amine is incorporated, and a double bond appears again. The C=O of the aldehyde or ketone is replaced with the C=N of an imine. Imines form important linkages in biological chemistry, especially in connecting small molecules to lysine side chains in proteins. If the amine is "secondary", meaning the nitrogen is connected to two carbons instead of just one, the double bond ends up one position over. It is between the former carbonyl carbon and the one next to it, which is called the alpha position. Note that all three of these reactions involve ultimate loss of water from the original carbonyl compound. That's a very important feature of reactions with neutral nucleophiles. Addition of a neutral nucleophile to a carbonyl almost always leads to loos of the original carbonyl oxygen in a water molecule. Fill in the missing reagents or products in the following reaction equations.